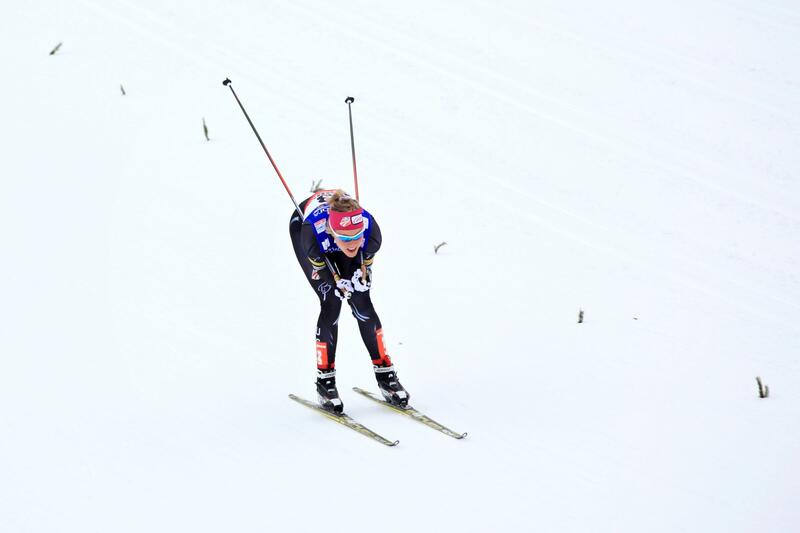 Sadie Bjornsen in the 2013 Nordic World Championships at Val di Fiemme, Italy. She is on the U.S. Olympic team. 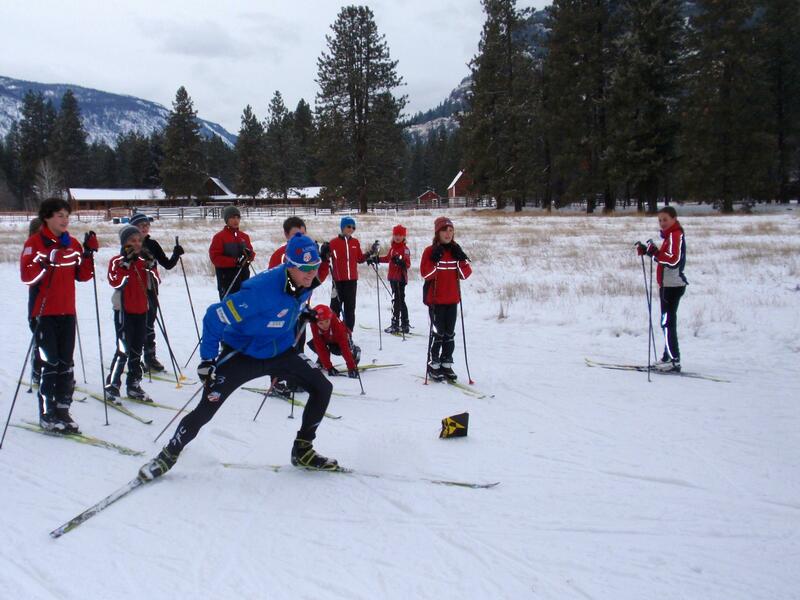 Olympic hopeful Erik Bjornsen demonstrates racing technique at a kids' ski clinic in Mazama, Wash. He hopes to join his sister Sadie at the Winter Olympics. As snowboarders, skiers and skaters finish their qualifying events to get to the Winter Olympics next month, cross-country skiing siblings Erik and Sadie Bjornsen are waiting to find out if their special edge — each other — will get them both to the games. Sadie has secured a spot on the Nordic team based on her good season; for Erik, the next two weeks will be the clincher. U.S. Ski Team coaches and officials will wait until practically the last moment to finalize their Olympic squad. They want to have as many of this winter's race results as possible to evaluate rankings and get a feel for who's just plain hot. During the off-season, the Bjornsens live together and train at Alaska Pacific University, where both are students. Erik, 22, says he and his sister both really want to go to the Olympics together. "It would just be nice," he says. "I think I can post better results when she is around cheering for me. I feel more comfortable just on the road with her. If I ever have any problems, there is someone I can go to." "As a sibling you always have a little more of an open connection," says Sadie, 24. "It's easy to get feedback from a sibling and not be threatened, and I think that Erik has been awesome for that because he has encouragement when I need it, and also a reminder when I need it." Their mother, Mary, says all three Bjornsen children had an athletic upbringing with constant friendly competition. "I can remember people wondering when Erik was going to start beating Sadie," she says. "It took a while, actually. Sadie was fast." "Everything was a competition — from running to the car, the first one to get there," says Sadie. "Or balancing at [our dad's] job site on a beam as long as you could." Sadie remembers her Olympic dream taking root when she was a child. She particularly recalls a welcome-home parade after the 1998 Nagano Games for a local cross-country skier. "I remember distinctly Laura McCabe riding in on a fire truck, the whole valley lining the streets and clapping," says Sadie. "That was the moment. I was like, 'This is so neat.' It's such an honor. I knew I was going to be an Olympian." Erik and Sadie grew up with former Olympic skiers as neighbors on two sides. An enviable, 120-mile-long Nordic trail system starts practically at their doorstep. How rare would it be to send siblings to the Winter Games? Neighbor and ex-Olympic Nordic skier Leslie Thompson Hall says it happens more often than you might think. "You know, certainly once someone is involved in a sport, it's easy to have another kid in the family join the sport too," Hall says. "To have two exceptional athletes is not that unusual either." Phil and Steve Mahre took home medals in skiing at the 1984 Winter Games, and Eric and Beth Heiden medalled in speedskating in 1980. This year, two sibling pairs have secured spots on the U.S. men's and women's ice hockey teams. In the wider field of hopefuls, there could be at least four more in sports ranging from snowboarding to freestyle moguls. On a recent day, Erik is taking a day off from training to coach junior racers from his home valley, just like former champions once did for him. He would normally have help from his big sister to lead this annual clinic, but she was on the World Cup ski racing circuit in Europe, so he demonstrates cross-country racing techniques and finishing lunges by himself. "I like to think of myself as a kangaroo sometimes ... and just bouncing off each foot in skiing," he tells the kids. The class full of 8- to 13-year-olds mimics his every move. Later, many say they want to follow in the Bjornsens' path. "I've always wanted to go to the Olympics as well," says seventh-grader Emerson Worrell. He gushes about learning "really cool" techniques from Erik that could help get him there. The Bjornsens and the other ski and snowboard hopefuls will learn for sure who is on Team USA during the week of Jan. 20. It's also crunch time for some other U.S. athletes vying for a chance to compete in Sochi. In cross-country skiing, one brother-sister duo is waiting to find out if their special edge, each other, will get them both to the games. One knows she's going. Her brother doesn't yet. Our latest profile of an Olympic hopeful comes from Northwest News Network's Tom Banse. TOM BANSE, BYLINE: Last month, U.S. Nordic ski team member Erik Bjornsen took a day off from training to coach and inspire junior racers from his home valley, just like former champions once did for him. BANSE: The 22-year-old Bjornsen would normally have help from his big sister Sadie to lead this annual clinic. But she's on the World Cup ski racing circuit in Europe. So he demonstrates cross-country racing techniques and finishing lunges by himself. BANSE: A class full of 8- to 13-year-olds mimics his every move. Later, many tell me they want to follow in the Bjornsens' path. Emerson Worrell is in the seventh grade. EMERSON WORRELL: I've always wanted to go to the Olympics as well, yeah. BANSE: And are you learning things that will help? WORRELL: Yeah. It's really cool. BANSE: Sadie Bjornsen remembers being even younger than Emerson when her Olympic dream took root. She's now 24. Speaking from France via Skype, she recalls a welcome home parade after the Nagano Games for another local Olympic cross-country skier. SADIE BJORNSEN: I remember distinctly Laura McCabe riding in on a fire truck, the whole valley lining the streets and clapping. And that was the moment, I was like, this is so neat, you know. Like, this is - it's such an honor. And I knew I was going to be an Olympian. BANSE: The Bjornsen kids eventually grew up outside Mazama, Washington with former Olympic skiers as neighbors on two sides. An enviable Nordic trail system starts practically at their doorstep. Mary Bjornsen is the mother in this close-knit family. She says all three of her kids had an athletic upbringing with constant friendly competition. MARY BJORNSEN: I can remember people wondering when Erik was going to start beating Sadie. And it took a while, actually. Sadie was fast. BJORNSEN: Everything was a competition, from running to the car, the first one to get there, balancing on the job site on a beam as long as you could. BANSE: Erik and Sadie tried to make the Olympic team four years ago but came up short. They've kept spurring each other on to this day. During the offseason, the Bjornsen duo live together and train at Alaska Pacific University where both are students. Erik says he and his sister both really want to go to the Olympics together. BJORNSEN: Well, you know, as a sibling you always have a little more of an open connection. It's easy to get feedback from your sibling and not be threatened, and I think that Erik has been awesome for that because he's encouragement when I need it and also a reminder when I need it. BANSE: U.S. ski team coaches and officials will wait until practically the last moment to finalize their Olympic squad. They want to have as many of this winter's race results as possible to evaluate rankings and get a feel for who's just plain hot. 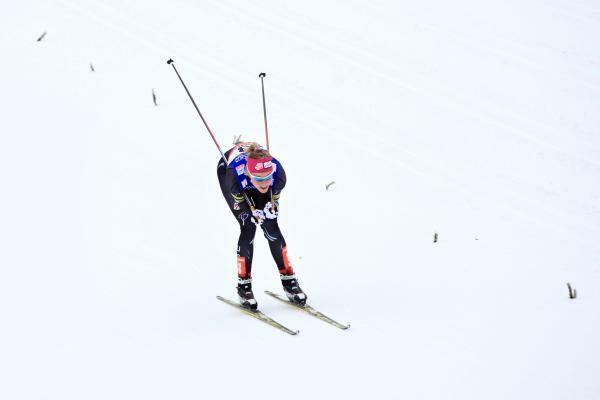 Sadie has secured a spot on the Nordic team based on her good season to date. For Erik, the next two weeks will be the clincher. LESLIE THOMPSON HALL: You know, certainly once someone is involved in a sport, it's easy to have another kid in the family join the sport, too. So - and to have two exceptional athletes isn't that unusual either. BANSE: Olympic medallists Phil and Steve Mahre in skiing, and Eric and Beth Heiden in speed skating are earlier examples of sibling success at the Winter Games. This year, two sibling pairs have secured spots on the U.S. men's and women's ice hockey teams. And in the wider field of hopefuls, there could be at least four more in sports ranging from snowboarding to freestyle moguls. For NPR News, I'm Tom Banse, near Mazama, Washington. Transcript provided by NPR, Copyright NPR.